Do online courses increase access to education? Each month, the NBER Digest summarizes several recent NBER working papers. These papers have not been peer-reviewed, but are circulated by their authors for comment and discussion. With the NBER’s blessing, Making Sen$e is pleased to feature these summaries regularly on our page. The following summary was written by the NBER and doesn’t necessarily reflect the views of Making Sen$e. Online coursework has been heralded as potentially transformative for higher education, but little is known about whether it increases the number of people pursuing education or simply substitutes for existing options. In “Can Online Delivery Increase Access to Education?” Joshua Goodman, Julia Melkers and Amanda Pallais provide the first evidence that online education can expand access to students who would not otherwise have enrolled in an educational program. They study the earliest educational model to combine the inexpensive nature of online education with a degree program from a highly ranked institution. READ MORE: Can online courses replace a campus education? In the spring of 2014, the Georgia Institute of Technology’s Computer Science Department started enrolling students in a fully online version of its highly ranked master’s degree. The Online Master of Science in Computer Science costs about $7,000, less than one-sixth the price of its in-person counterpart. The degree is not labeled “online” and is in name fully equivalent to the in-person degree. Georgia Tech designed the Online Master of Science in Computer Science such that its courses are online versions of the same courses in-person students take, designed by the same faculty and graded using the same standards. The researchers document very high demand for the Online Master of Science in Computer Science, now the nation’s largest computer science master’s degree program, particularly from mid-career Americans who do not appear interested in the in-person version. Some 80 percent of those admitted to the online program enroll, suggesting few find compelling alternative educational options. To study whether online education is just a substitute for an in-person alternative, the researchers exploit the fact that the first cohort of Online Master of Science in Computer Science applicants faced a GPA threshold that generated quasi-random variation in admission among otherwise identical applicants. Those just above the threshold were roughly 20 percentage points more likely to be admitted than those just below it. 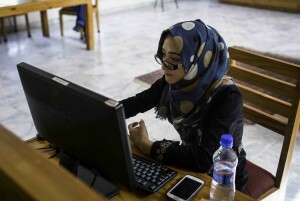 Moreover, the authors find that nearly all of those who were just above the threshold and who were admitted chose to enroll in Online Master of Science in Computer Science. Very few applicants enrolled in non-Online Master of Science in Computer Science programs. 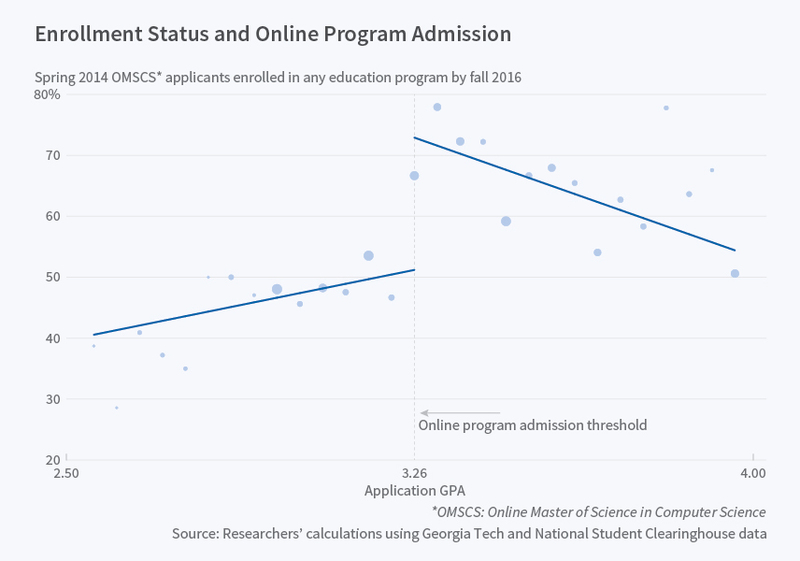 Those just below the admission threshold were no more likely to enroll elsewhere than those just above it, which implies that the online program did not substitute for other educational options. These findings suggest that online access substantially increases the overall number of students enrolling and that the higher education market was failing to meet demand for this online option. Blind grading of exams suggests Online Master of Science in Computer Science students learn as much as their in-person counterparts. They also persist at rates substantially higher than in many online settings, with likely degree completion rates between 60 and 90 percent. Such persistence rates among the nearly 1,200 Americans enrolling each year implies the Online Master of Science in Computer Science will produce at least 725 new American master’s degrees annually. Roughly 11,000 Americans earn their master’s degree in computer science each year, implying this single program will boost annual national production of American computer science master’s degrees by about 7 percent. The researchers suggest that online programs using the low-cost, high-quality model highlighted here could tap unmet demand for skill upgrades in other fields. They note that the University of Illinois Urbana-Champaign offers an online version of its MBA, that Yale is developing an online master’s degree for physician assistants and that multiple universities in the edX consortium are offering “micro-master’s” in various subjects. “Online education can provide mid-career training without forcing individuals to quit their jobs or move to locations with appropriate educational institutions,” they write. They point out that a key unresolved question is the effect of an online degree, relative to a traditional degree, on earnings and labor market outcomes.